It’s no secret that I am somewhat of a Hawk Head. That is I am a huge fan of the father and son knifemaking duo of Grant and Gavin Hawk. Well, the Hawks — who are best known for making some of the most innovative and boundary-pushing knives on the market — are back with another production model called the Gearhead. 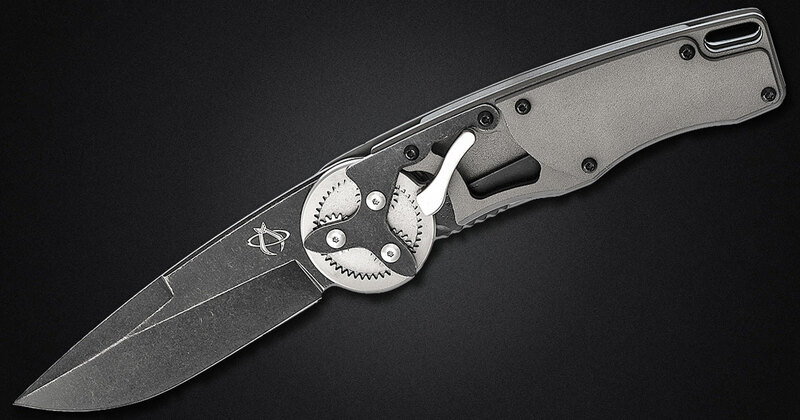 The aptly named Mantis Gearhead is a new design that uses a lever to turn gears to engage the knife. According to the Hawks, they made the design after noticing that people like to put gears on knives for decoration. They wanted to make a knife with functional gears. The deployment method looks quick, reliable, and really fun to use. I believe the whole gear thing comes out of the category of steampunk knives that put a bunch of gears and other anachronistic technology on the knives. Stefan Steigerwalds is probably the best at this genre of knives (and all others really pale in comparison). The new Hawk knife is a collaboration with Mantis Knives. Many people are disappointed in the decision to go with Mantis because of their rocky past, but the Hawks insist that internal changes in the company have made it better. On top of that, this isn’t the first knife the Hawks have done with Mantis. The brand also carries the really interesting Vicious Circle neck knife, which is a version of their Cyclops. It’s been a while since we’ve seen something really new from the Hawks. It seems like the Hawks have been busy with their Deadlock OTF — another innovative knife that completely redesigns the internals of the classic out the front automatic knife. On top of that, I believe they have also been working on some of their past knives like the MUDD. That’s why this new knife is a welcome. The Mantis Gearhead comes in a drop point or tanto point profile with different finishes and edges. The blade is 4 inches and is made of proprietary M-vX steel. The blade locks with a liner lock. Unfortunately, there are a few major downsides. First is the price. The MSRP is a confusing $260. That’s pretty steep for a knife that uses these materials. Second, while the gears are great to look at and seem to run smoothly, it remains to be seen just how something as innocuous as lint can spell trouble. I wonder if it would have been better if there were some transparent cover like you see on the back of some watches to show off the works. it’s just cool. And it opens fast. . .but mainly just cool. People like to put gears on knives for decoration, we wanted a knife with functional gears. I have no problem with this and always welcome innovative and bizarre knives. What is Lock Stick and How Do You Fix It?